How did you come up with the concept for Okinawa Rush? I came up with the concept of Okinawa Rush, after playing an indie game called Secret Agent that focused on time attack/speedrun gameplay. My idea was to combine a speed-run platform game with a complex fighting engine, starting off as a powerful character right from the beginning rather than having to “unlock” moves. In a sense, the game has the core drive of a modern fighting game which is about learning and mastering a large move set that’s immediately available to the player. I wanted the gameplay itself to be the motivation for playing rather than the lure of leveling up. I had been thinking over various ideas of what the game could be about and then one night I had a dream about a Karate Grandmaster of immense power fighting off hordes of Ninja’s! I was so inspired I got to work the next morning working on an early prototype of the game. What inspired you to develop Okinawa Rush? Both myself and David have been lucky enough to grow up in the early days of gaming and when kung fu movies like enter the dragon were a big thing. Some of our favorite games from the 80s were on the C64. Titles like IK+, Yie ar Kung Fu, kung fu master, Bruce Lee, Way of the exploding fist, the last ninja. In the 90s we moved into the era of the Amiga, Supernes and Megadrive where we were captivated by the likes of Shadow of the Beast, Super Mario, the first samurai, Panzer Kickboxing, Dragon Ninja, Ninja Gaiden, Gods, Streetfighter 2, Mortal Kombat and Streets of Rage 2. Later the Ps1 came along and Namco introduced the Tekken series to the gaming world which was a huge influence on myself. All the games mentioned have had some kind of influence of what we have created with OkinawaRush either graphically, musically, or in terms of gameplay. 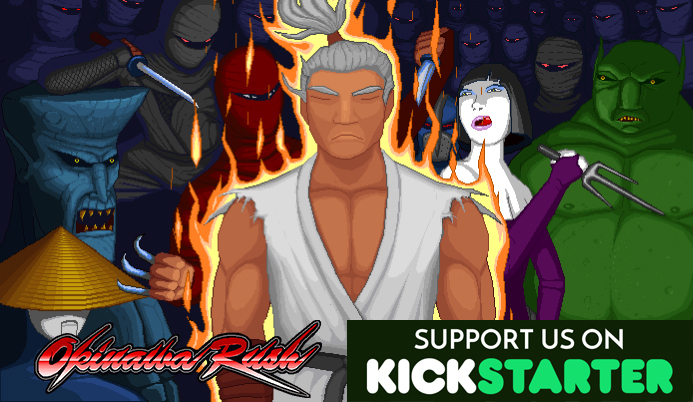 If I was to put it in a nutshell, our game is a mix of Super Mario, Streetfighter, tekken and a pinch of Mortal Kombat. Tell me more about the game? The game has evolved over many years, I originally started the game myself but pitched the game to David and he was immediately hooked. We both knew the project had great potential even in its early conception because the gameplay was good from the outset. We both discussed the plot together and how the story would unfold. David spent a lot of time working on the graphics and overhauled the entire look of the game a couple of times until it all came together. There was a lot of work involved in this and every visual aspect of the game has been designed including the fonts. Animation demands a lot of patience and dedication, particularly when working in pixel art at a low resolution. Okinawa Rush has a lot of characters and moves to animate.- In a lot of situations, he was having to draw the details of a face within about nine pixels! As well as the programming I’ve also been responsible for the sound design, trying to capture satisfying combat sounds like you would find in a kung fu movie. I also made it so that hitting sounds would raise in pitch or lower in pitch depending on the circumstances. I made a few pieces of music for the game as I used to make a lot of drum n bass style tunes in the past, and made all the music for our previous game Robotopia. David has also dabbled in music for a long time. He found that his skills lent themselves well to the composition and started making what he describes as electro oriental tunes. He wanted to make a theme tune for the game which is what you here in the title screen menus. A big influence for this was when he heard the intro music for an old Amiga game called the First Samurai. He also went on to make the music for the trailers, one of them, in particular, is influenced by 70s kung fu movies. We decided not to create more than 1 stage until the gameplay was right and the graphics, music, and sound were at a good standard. This was with the intention that we could pitch the project to reviewers/publishers and let them see for themselves what the rest of the game could be like. Due to this restriction, it gave us scope to flesh out the game “sideways” adding lots of other features, such as the training mode, boss-rush, editing dojo, Fengshui, traveling merchant shop and kata training. What is unique about Okinawa Rush? It has a few unique features; the ability to parry “anything” is unheard of in a game like this. You can even parry the traps and all the boss attacks. It has a Fengshui system – where you can place ornaments earned from the game in various positions to get bonus stats. Although there have been beat em up titles like double dragon or streets of rage I don’t think we’ve come across anything that has combined a side on the platformer with the kind of martial arts combat that’s in Okinawa rush. Any exciting updates coming for Okinawa Rush, what are you working on now? What kind of gamer Okinawa Rush the most? Anyone who likes platform games or deep fighting games (such as SF or Tekken) retro-game fans should enjoy Oki too. The core engine of the game is done. What it needs next is more content and David has already drawn up a lot of level designs and characters on paper for future content. We are aiming to have 5 stages potentially made up of 2 sections and a boss enemy at the end of each stage, like the Rockman in stage 1 demo. There will be a unique set of enemies each with different ways of attacking and challenging the player. David will be creating further cut scenes between some of the stages that move the story along 4 more stages need to be implemented, along with a unique boss for each stage. – Meilin (female character) needs to be coded in and animated fully. She has a completely different fighting style (Wing Chun kung fu), so this will take time. Where can we support, play and follow Okinawa Rush?